Despite a moratorium on nuclear testing, the nuclear arms race continues unabated at very high costs. In addition to the startling cases of LLNL’s mismanagement of dangerous materials and ‘accidental‘ releases, the facilities are still testing every radioactive component of a nuclear bomb in open air, according to sources. Malignant melanoma (skin cancer) rates are six times higher among children born in Livermore; melanoma has been linked to radiation exposure. And the amount of radiation which has been expelled from the lab since its inception is equivalent to that released from the bombing of Hiroshima. Most disturbingly, the Livermore community is largely unaware of what the lab is actually doing and what its potential impacts are on its health and the environment. Abby Martin Narration (c. 0:36): “The United States used to blow up full-scale nuclear weapons in open air until the 1963 Limited Test Ban Treaty, which permitted the continuation of nuclear testing underground. In 1992, Congress passed the Nuclear Testing Moratorium Act, which banned all nuclear testing. However, the treaty is not yet ratified. And the U.S. still has over 5,000 nuclear weapons, 2,000 of which are on readiness alert at all times. To compensate for the loss of full-scale underground nuclear testing, the Department of Energy created the Stockpile Stewardship Program, which built new facilities that test different components of a nuclear weapons explosion, using super computers to put them all together. “Most of the PR surrounding the Lawrence Livermore Lab gives the impression that it’s a technology innovator, working to harvest the energy of the sun to create clean energy for the world. As it turns out, out of the Lawrence Livermore Lab’s $1.5 billion dollar annual budget, less than 1% is alternative energy; the rest is defence and nuclear weapons development. “Another, more elusive, site buried in the hills behind the Lawrence Livermore Lab is called Site 300, a live-fire explosives test range where they blow up highly radioactive compounds used to simulate many of the nuclear systems designed at the lab. Site 300 is mountainous with many watersheds and canyons making contamination easy to spread and clean-up extremely difficult. At Site 300, we found that they are testing depleted uranium and tritium, the radioactive hydrogen in the hydrogen bomb, in open air tests. Site 300 happens to be located in a very high-velocity wind area. Abby Martin: “So, what did you do there? Marylia Kelley (Tri-Valley CAREs): “The state health department did a study of childhood cancers and this was a record study covering 30 years. And they found that children born in Livermore have six times the expected rate of malignant melanoma. Abby Martin Narration (c. 5:16): “During the ‘70s and ‘80s, the Lawrence Livermore Lab was flushing radioactive materials, including plutonium down the drain. And it was recycled by the City of Livermore’s sanitation department as compost. The City then gave away the toxic compost as landscaping. “Local residents around the lab have even coined a neighbourhood park, plutonium park, which is located adjacent to a school. Marylia Kelley (Tri-Valley CAREs): “They kept a log book, you know, a guest register. So, people signed it, but one day the lab showed up and took it with them. And it’s never been seen again. So, there’s no way to track who has this plutonium-contaminated sludge or if the particular bit of sludge they took home has plutonium contamination in it or not. Abby Martin Narration: “Despite the moratorium, we continue to find a way to test nuclear weapons. 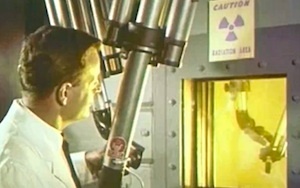 But by testing each component of a nuclear bomb separately with Site 300, the NIF, and super computers, they’re able to pacify the public. However, in the back of our minds, we all know that at any moment—by mistake, by miscalculation, or by madness—life, as we know it, could end on this planet. This is the perfect way to break down this infrmoation.